The first trailer for Jurassic World, the fourth installment in the Jurassic Park franchise, just came out two weeks ago. Director Colin Trevorrow talked with Movie Magazine Empire about what we can expect in the new dinosaur disaster flick. Jurassic Park has been around the block for quite a while now and with three movies reached millions of people who were interested in seeing dinosaurs walk the face of the earth again. With the release of the first official trailer for the new film Jurassic World, millions of people reacted enthusiastically and had a lot of questions on what they saw in those two and a half minutes. Luckily Jurassic World director Colin Trevorrow opens up and tells Empire he’s not afraid to take the movie to “Crazytown”, this includes “genetically-modified hybrid” dinosaurs and trained Raptors. “We’ve got the most awe-inspiring creatures to ever walk the Earth right in front of us, but for some people this was not enough”, says Trevorrow. “We’re always hungry for the next thing, and those who profit from it are always looking to feed that hunger. The focus group for this new film wanted something bigger than a T-Rex. So, that’s what they get”, he explains. 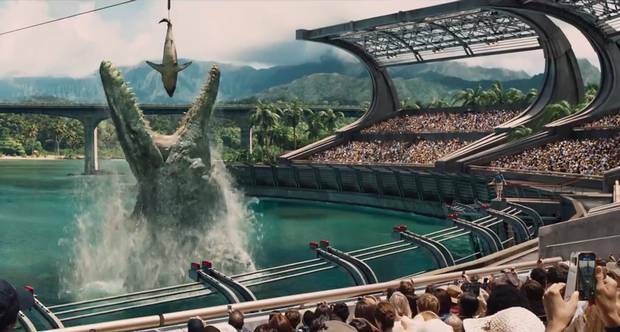 One of those new ‘bigger than a T-Rex’ creatures is the Mosasaurus, the water-dwelling lizard, we saw in the trailer snacking on a Great White shark. “I don’t know if Steven Spielberg or Frank Marshall had considered an underwater reptile, so I pitched the Mosasaurus and went off on the idea”, reports Trevorrow. “I thought it would be cool if we had this gigantic animal and the park used one of our most fearsome modern predators as food. There could be a whole other facility where they used shark DNA to mass-produce the sharks to feed the bigger beast. It’s a bonkers idea, but I’m comfortable going to Crazytown, because I used to live there when I was a kid”, laughs Trevorrow. Last but not least, the T-Rex. While there wasn’t a single Tyrannosaurus to be seen in the trailer, the Jurassic World director confirmed that the franchise’s notorious killer will make an appearance. 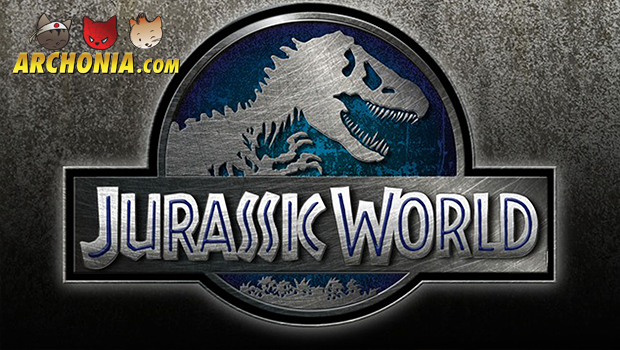 The official Jurassic World website has also been updated with a new map of the remodeled park. You can now virtually explore the dino theme park before the film opens on June 12, 2015. Previous Post : Iron Man's Samurai Armor Awesomeness Next Post : Geekly News Round-Up - Last week's headlines you can't miss!